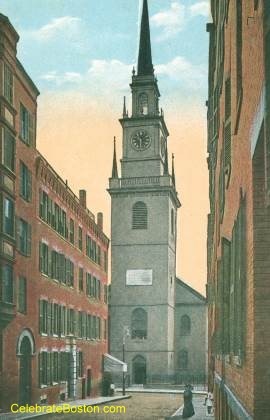 The Old North's Church, or Christ Church, built by Episcopalians in 1723, is the oldest church now standing in Boston. The brick building is 70 by 50 feet in dimensions, and the steeple is 173 feet high. The steeple accurately represents one that was blown down during the Hurricane of 1804. The tower contains a fine chime, brought from England, and is said to be the oldest in America. King George II gave a Bible, prayer books, and silver to the church in 1733. 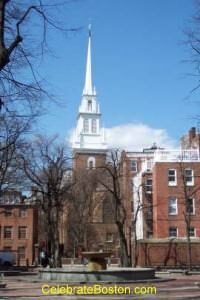 Paul Revere's Ride, a poem by Henry Wadsworth Longfellow, made famous the ride by Paul Revere, warning the surrounding towns that The Regulars are Coming Out, or departing Boston (often misquoted as The British Are Coming!). Paul Revere's House still stands in Boston's North End. The Midnight Ride occurred on April 18, 1775. It was learned the Patriots had a store of weapons at Concord, about 20 miles west of Boston. British General Gage made plans to take the store, and was about to move on Concord. Revere left via Charlestown, having first crossed the Charles River in a small boat under the nose of a British warship. William Dawes, Jr., the other messenger, left over land via Roxbury. They both rode swiftly to Lexington, warning the countryside that the Red Coats were on their way. In each town, bells were sounded, and the minutemen were awakened and called to arms. The Battle of Lexington and Concord took place the next day on April 19, 1775. The reason lanterns were displayed at Old North, was that if a messenger was prevented from leaving Boston, the word would still get out to the surrounding towns. Two lanterns were displayed that night. The British forces departed via Boston Common—which then bordered the Charles River—and rowed over to Cambridge (One if by Land, Two if by Sea). A strange note about Old North is that in September 1757, John Childs, an aviator wearing homemade wings and tethered to a rope, made what can be considered the first human flight in North America.